The sturdy Kettler gloves UNISEX Basic offer a versatile use: strength training, rope skipping or push-ups. 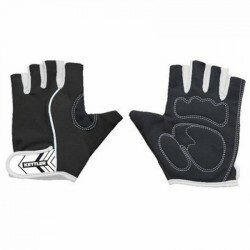 They are ergonomically shaped and provide a safe and strong stability due to the hook-and-loop fastener on the wrist. The hard-wearing KETTLER training gloves are equipped with a terry insert on the back of the hand for wiping sweat. The high-quality workmanship and double seams guarantee a long durability.